Insulin resistance (IR) plays a key role in the pathophysiology of obesity-related diseases such as type 2 diabetes and nonalcoholic fatty liver disease. It has been demonstrated that IR is associated with a state of chronic low-grade inflammation, and several mediators released from various cell types, including immune cells and adipocytes, have been identified as being involved in the development of IR. Among those are several pro-inflammatory cytokines such as tumor necrosis factor-α (TNF-α), interleukin (IL)-1, IL-6, and various adipocytokines. Furthermore, several transcription factors and kinases such as c-Jun N-terminal kinase (JNK) and inhibitor of kappa B kinase-β (IKKβ), a kinase located proximal of nuclear factor-κB (NF-κB), participate in this process. Hepatocyte-specific overexpression of NF-κB is associated with IR and can mimic all features of fatty liver disease. Whereas the evidence for an important role of many pro-inflammatory pathways in IR in in vitro and animal studies is overwhelming, data from interventional studies in humans to prove this concept are still minor. As a complex network of inflammatory cytokines, adipocytokines, transcription factors, receptor molecules, and acute-phase reactants are involved in the development of IR, new therapeutic approaches in IR-related diseases will be based on a better understanding of their complex interactions. The number of obese and overweight individuals has risen dramatically over the last two decades. Obesity not only is associated with the development of type 2 diabetes (T2D) and hypertension but also has negative effects on liver function, leading to diseases such as nonalcoholic fatty liver disease (NAFLD). Insulin resistance (IR) is the key primary defect underlying the development of T2D and is a central component defining the metabolic syndrome, a constellation of abnormalities including obesity, hypertension, glucose intolerance, and dyslipidemia. IR has been defined in the last decade as being frequently associated with a state of low-grade inflammation, and therefore it is assumed that inflammation contributes in a major way to its development (1,2). Besides the fact that IR is characterized by complex interactions between genetic determinants, nutritional factors, and lifestyle, it is increasingly recognized that mediators synthesized from cells of the immune system as well as by adipose tissue are critically involved in the regulation of insulin action (3). The details of insulin receptor signaling pathways are not presented here because of limited space (4). Briefly, insulin acts in all cells by binding to its specific receptor and thereby activating a cascade of intracellular signaling events. It stimulates tyrosine phosphorylation of insulin receptor substrate (IRS) proteins, which is a crucial event in mediating insulin action (4). This step in insulin-receptor signaling is one of the key molecular events in inflammation-associated IR (2). Serine phosphorylation of IRS-1 by various inflammatory signals thereby seems to be one of the key aspects that disrupt insulin-receptor signaling (2). This article summarizes current knowledge on involved inflammatory mediators in the process of IR (Table 1). Mediators of immune cells and adipocytes involved in the regulation of insulin resistance. TNF-α. The first link between obesity—increase in the expression of a pro-inflammatory cytokine, namely TNF-α—and insulin action came from a study almost 15 years ago (5). These findings led to the concept of inflammation in obesity and demonstrated that adipocytes express TNF-α. In these studies, expression of this cytokine in obese animals (fa/fa rat and ob/ob mouse) was increased and shown to regulate insulin action (5). Further evidence supporting a key role for TNF-α in IR came from studies published by Uysal et al., where they showed that mice lacking TNF-α or TNF receptors had improved insulin sensitivity in both dietary and genetic (ob/ob) models of obesity (6). These observations were paralleled by similar findings in humans (7), with increased adipose tissue TNF-α expression in obesity and improvement of this increased TNF-α expression following weight loss (8). At a molecular level, exposure of cells to TNF-α or elevated levels of free fatty acids (FFAs) stimulated inhibitory phosphorylation of serine residues of IRS-1 (9,10). TNF-α has certainly been “the” pro-inflammatory mediator introducing the link between inflammation, obesity, and IR. Interleukin-1. IL-1α and IL-1β are among the first identified cytokines and exert strong pro-inflammatory functions (11). IL-1a−/− mice have lower fasting glucose and insulin levels and improved insulin sensitivity, as determined by insulin tolerance testing, compared with wild-type controls (12). IL-1β together with IL-6 concentrations predict risk for T2D in humans better than either cytokine alone (13). IL-1β is able to reduce IRS-1 expression at a transcriptional level through a mechanism that is ERK dependent and at a posttranscriptional level independent of ERK activation (14). By targeting IRS-1, IL-1β is capable of impairing insulin signaling and action and could thus participate, in concert with other cytokines, in the development of IR. IL-6 and gp130 receptor ligands. The IL-6 cytokine family (or long type I or gp130 cytokines) consists of ciliary neurotrophic factor (CNTF) as well as IL-6, IL-11, leukemia inhibitory factor, oncostatin M, and cardiotrophin 1. IL-6 signals via induction of a gp130 homodimer after binding to the IL-6 receptor (15). Most research on obesity-related aspects has centered on IL-6 and CNTF. IL-6 was among the first cytokines implicated as a predictor or pathogenetic marker of IR and cardiovascular disease. Concentrations of IL-6 decrease in parallel with weight loss and improvement of IR in patients undergoing bariatric surgery (16). Visceral fat has been demonstrated as an important site for IL-6 secretion in humans (17). IL-6 production in abdominal adipose tissue is at least three times higher compared with subcutaneous adipose tissue, thereby potentially contributing to hepatic IR. This cytokine may be indeed involved in the pathogenesis of hepatic IR, as insulin sensitivity increases in diet-induced obese mice treated with anti-IL-6 antibodies (18). IL-6−/− mice are insulin resistant and develop mature-onset obesity (19). However, these results were not reproducible in another IL-6−/− mouse model, as those authors did not observe age-related obesity (20). This discrepancy has been somewhat clarified by a later report, which initially described obesity in IL-6−/− mice (21) by demonstrating a decreased energy expenditure and thermogenesis compared with wild-type mice, which might help to explain development of obesity at an advanced age (22). Gp130 cytokines signal through a receptor that has many similarities to leptin signaling, and leptin is known to activate signal transduction pathways that promote increased energy expenditure and insulin sensitivity (21). IL-6 has been shown (like leptin) to activate AMP-activated protein kinase (AMPK) in both skeletal muscle and adipose tissue. Consistent with activation of AMPK, IL-6 has also been shown to increase fat oxidation in vitro, ex vivo, and in humans in vivo (23). A clear answer to the role of IL-6 in IR will be possible when patients with T2D and/or IR receive treatment with an IL-6 neutralizing antibody. Unlike IL-6, CNTF lacks a signal peptide and is therefore not secreted by cells in a classic manner. The anti-obesogenic properties of CNTF treatment were uncovered in a study of patients with amyotrophic lateral sclerosis. Whereas this approach was clinically not successful, these patients experienced involuntary weight loss (24), a phenomenon which has also been observed after IL-6 administration to humans. CNTF is able to reverse obesity-induced IR by activating skeletal muscle AMPK activity (25). This was the first report providing evidence that CNTF could act in a manner independent of central mediation. IL-18. IL-18 is another pro-inflammatory cytokine that plays a role in septic shock, joint inflammation, and inflammatory bowel diseases (26). A constitutive intracellular pool of IL-18 exists, and release is mainly regulated by activation of a caspase-1 that cleaves pro-IL-18. Its bioactivity on the other side is under tight control of its physiologic antagonist, the IL-18 binding protein. It has been postulated that increased IL-18 concentrations observed in patients with T2D might reflect a role in the regulation of IR (27,28). Indeed, as recently elegantly demonstrated, IL-18−/− mice and IL-18R−/− mice had increased body weight accompanied by IR, hyperglycemia, lipid abnormalities, and atherosclerosis compared with wild-type mice (29). Intracerebral administration of recombinant IL-18 inhibited food intake and reversed hyperglycemia in these mice by activation of STAT3 phosphorylation. Increased IL-18 levels in patients with T2D might reflect either a frustrated attempt of IL-18 to counteract hyperglycemia or could also reflect resistance to this cytokine, as observed for others such as insulin or leptin. Such an explanation could also be offered for the increased IL-6 levels observed in stages of IR. MCP-1. Adipocytes secrete various chemoattractants that attract monocytes. It has been demonstrated that obese adipose tissue exhibits increased expression of CCL2 (or MCP-1), a key factor in the recruitment of macrophages (30). These authors demonstrated that CCL2−/− mice exhibited reduced macrophage infiltration in the adipose tissue and reduced IR. Conversely, they observed an increase in macrophage infiltration when CCL2 was overexpressed. Another study also revealed reduced macrophage infiltration in the adipose tissue and decreased IR in CCL2−/− mice (31). In contrast, Inouye et al. (32) recently demonstrated that the absence of CCL2 in mice does not limit obesity-associated infiltration of macrophages into adipose tissue. In that study, the authors used CCL2−/− mice and adipose tissue was collected for analysis of macrophage infiltration. Surprisingly, CCL2−/− mice on a high-fat diet showed no reductions in adipose tissue macrophages, although they were glucose intolerant and had mildly increased plasma glucose and decreased serum adiponectin levels compared with wild-type mice. These data could suggest that CCL2 might not be the only critical mediator for adipose tissue macrophage recruitment. There are, however, several other candidates that might play a role in the recruitment of monocytes/macrophages into the adipose tissue, such as migration inhibitory factor (MIF) or macrophage inflammatory protein-1α (MIP-1α). Adiponectin. Adiponectin is mainly synthesized by adipocytes and to a small degree by other cells (33,34). It exists both as a full-length protein as well as a proteolytic cleavage fragment, also known as globular adiponectin. Adiponectin circulates at high concentrations in human serum (5 to 10 µg/mL) and has a wide spectrum of biological activities (33). Serum levels of adiponectin are reduced in individuals with visceral obesity and states of IR (35). TNF-α suppresses the transcription of adiponectin in adipocytes, which might explain the lower adiponectin levels in serum in individuals who are obese (36). Weight loss induces adiponectin synthesis (37), as activation of peroxisome-proliferator-activated receptor γ (PPARγ) by its ligands thiazolidinediones (TZDs), which are used in the treatment of T2D (38). Initial studies suggested that adiponectin exerted anti-inflammatory effects on endothelial cells through the inhibition of TNF-α induced adhesion-molecule expression (39) and inhibited NF-κB activation. In obese animals, treatment with adiponectin decreases hyperglycemia and levels of FFAs in the plasma and improves insulin sensitivity (33). Furthermore, adiponectin-deficient mice develop diet-induced IR on a high-fat, high-sucrose diet (36). In other studies with adiponectin-deficient mice, however, these animals developed insulin resistance only if fed a high-fat diet (40) or failed to develop insulin resistance even when fed a high-fat diet (41). Two receptors for adiponectin have been identified (adipoR1 and adipoR2). AdipoR1 is widely expressed in mice, whereas adipoR2 is mainly expressed in the liver (42). The importance of targeted disruption of adipoR1 and R2 has recently been demonstrated (43). Disruption of both receptors abolished adiponectin binding and actions, resulting in increased triglyceride content, inflammation, and oxidative stress, thus leading to IR and marked glucose intolerance. These studies together strongly support a major role for adiponectin in regulating insulin sensitivity. Kim et al. (44) have recently presented an exciting work demonstrating that expansion of adipose tissue could also be associated with an improved metabolic profile. In their studies, they created a mouse lacking leptin and overexpressing adiponectin. Importantly, in these mice, despite being severely obese, the increase in circulating full-length isoform of adiponectin resulted in a reversal of the diabetic phenotype of ob/ob mice with normalization of glucose and insulin levels. In this model, a massive expansion of subcutaneous adipose tissue mass was associated with a modest two- to threefold elevation of steady-state adiponectin levels in the plasma. Interestingly, macrophage infiltration into expanded adipose tissue was quite minimal. The mechanism of action of TZDs relies on the ability of their ligands to reduce hepatic lipid content and induction of adiponectin. Previous studies and this report fully support the notion that the potent antisteatotic effect of adiponectin in the liver reduces liver fat content, increases subcutaneous fat mass, and improves IR (44,45). Leptin. The discovery of leptin and the leptin receptor, the latter of which has both a long, full-length form (OBRb) and a short, truncated form, led to the hope that researchers had identified a highly effective molecule and/or pathway that could be targeted in the treatment of obesity (46). However, it soon became evident that obesity (a situation associated with high circulating leptin levels) resulted in leptin resistance in the central nervous system (CNS) where endogenous leptin was no longer effective (leptin resistance). This phenomenon, although not completely understood, has been linked to a decreased uptake of leptin into the CNS. Another potential mechanism for this resistance has been elevated suppressor of cytokine signaling (SOCS) protein expression, which occurs in both obese humans and rodents. SOCS3 binds to the leptin receptor and to phosphorylated JAK protein. This inhibits STAT from binding to the leptin receptor and getting phosphorylated/ activated. SOCS3 competes with Src homology-containing tyrosine phosphatase 2 (SHP-2) of the same phosphor-site on the receptor (46,47). In addition to its well-defined role in energy balance, leptin has important effects on glucose homeostasis. First, leptin is able to reverse hyperglycemia in ob/ob mice before body weight is corrected (48). It also improves glucose homeostasis in lipodystrophic mice and in humans with lipodystrophy or congenital leptin deficiency (49,50). Importantly, however, leptin failed to correct hyperglycemia in patients with obesity, further supporting the concept of “leptin resistance” in these patients (51). The glucose-lowering effects of leptin are mediated through different organs. Leptin improves insulin sensitivity in muscle by reducing intramyocellular lipid levels and activating AMPK (52). Leptin also improves insulin sensitivity in the liver. As in muscle, leptin decreases intracellular hepatic triacylglycerol levels (53). There might also be a direct interaction with insulin metabolism, as leptin inhibits insulin release (54). Altogether, data clearly support a role for leptin in the regulation of glucose homeostasis. Resistin. Resistin has been implicated in the pathogenesis of obesity-associated insulin resistance and T2D in mouse models (55), whereas such a role in humans is under debate (56). Although a clear function for resistin in humans is still lacking, its pro-inflammatory properties indicate a role in inflammatory processes (57). Resistin and adiponectin have reciprocal effects on vascular endothelial cells: resistin induces the expression of VCAM1, ICAM1, and pentraxin 3, whereas adiponectin downregulates the expression of these molecules (58). Muse et al. (59) recently showed that intrahyophthalmic resistin results in increased hepatic IR, which was associated with increased expression of TNF-α, IL-6, and SOCS-3 in the liver. This observation not only provides a new link how resistin might affect IR but also again demonstrates the role of the CNS in these metabolic processes. Pre-B cell colony-enhancing factor/nampt/visfatin. PBEF was originally cloned by Samal et al. (60) in search of novel cytokine-like molecules secreted from human peripheral blood lymphocytes. They described a 52-kDa secreted molecule termed pre-B cell-enhancing factor (PBEF) that was strongly induced by pokeweed mitogen and cycloheximide, and enhanced the effect of IL-7 and stem cell factor on pre-B cell colony formation. Intracellular PBEF acts as a dimeric type II phosphoribosyltransferase (nicotinamide phosphoribosyltransferase, nampt) (61). PBEF has been rediscovered recently and was demonstrated to be a novel adipocytokine more abundantly expressed in visceral compared with subcutaneous fat. It was therefore renamed “visfatin,” a protein associated with IR in animal models of IR. Visfatin was shown to mimic insulin activity by binding to the insulin receptor (62). Notably, very recently these results published by Fukuhara et al. have been questioned and the paper has been retracted (63). We found primarily proinflammatory activities for this mediator by showing that it dose-dependently upregulated the production of the pro-inflammatory cytokines IL-1β, IL-6, and TNF-α in human monocytes and in mice challenged with recombinant visfatin (64). Several human studies so far have not demonstrated a convincing association of this pro-inflammatory mediator with IR (65–67). Retinol-binding protein 4. Serum retinol-binding protein 4 (RBP4) is another characterized adipocytokine (68). Until recently, the function of RBP4 was thought to be the delivery of retinol to tissues. However, in patients with T2D, serum levels of RBP4 are increased (69). Transgenic overexpression of human RBP4 or injection of recombinant RBP4 in normal mice causes IR (68). Therefore, lowering RBP4 could be an interesting strategy for the treatment of individuals with T2D. There is now more evidence that RBP4 might be associated with obesity-related disorders and IR (70–73). Role of the IKKβ/NF-κB pathway. In searching for mechanisms involved in cytokine-induced IR, Yuan et al. (74) identified the IKKβ pathway as a target for TNF-α induced IR. Yin et al. (75) demonstrated in 1998 that aspirin and salicylates inhibit the activity of IKKβ. William Ebstein suggested 130 years ago (76) that high doses of salicylates lower high blood glucose concentrations. Yuan et al. demonstrated in their work that high doses of salicylates reverse hyperglycemia, hyperinsulinemia, and dyslipidemia in fa/fa rats and ob/ob mice, and overexpression of IKKβ attenuates insulin signaling in cultured cells. These findings clearly demonstrated the involvement of inflammatory pathways in IR highlighting the important role of IKKβ, a proximal mediator in NF-κB activation (Figure 1). Regulation of IR: involved mediators and pathways. In recent years, several inflammatory pathways involved in the generation/regulation of IR have been identified. TNF-α was among the first mediators defined as a key factor linking inflammation, obesity, and IR. Engagement of TNFR by TNF-α induces inhibitory phosphorylation of serine residues of IRS-1 and activates IKKβ/NF-κB and JNK pathways, two major intracellular regulators of IR. Moreover, TNF-α antagonizes adiponectin, an important insulin-sensitizing adipocytokine that signals via adiporeceptors. IL-1 and IL-18 are also able to induce IR. IL-1 has been shown to reduce IRS-1 expression via ERK1/2 and can activate the IKKβ/NF-κB pathway. A role for IL-18 in the regulation of IR has recently been demonstrated in IL-18−/− and IL-18R−/− mice. IL-6 is another cytokine involved in the generation of IR. This cytokine can induce SOCS1 and SOCS3 that link IRS to ubiquitin-mediated degradation. ER stress as well as oxidative stress are both involved in inflammation-associated IR. An important role for the IKKβ/NF-κB pathway has been demonstrated in experiments where knocking out or knocking down of IKKβ or JNK protected mice from IR. Two groups have shown the relationship between IKKβ expression in the liver and IR (77,78). Cai et al. (77) created a stage of chronic, subacute inflammation in the liver in a transgenic mouse model by selective hepatocellular activation of NF-κB causing continuous low-level expression of IKKβ. These mice exhibited a T2D phenotype with evidence of moderate systemic IR. IR was improved by systemic neutralization of IL-6 or by oral salicylate therapy. Arkan et al. (78) recently presented similar findings in mice lacking either IKKβ in hepatocytes or myeloid cells. Liver-specific deletion of IKKβ resulted in relative insulin sensitivity in the liver when placed on a high-fat diet or intercrossed with the ob/ob model of genetic obesity, but developed IR in muscle and fat. In contrast, mice deficient in myeloid IKKβ exhibited increased insulin sensitivity and were partially protected from IR. c-Jun N-terminal kinase (JNK). Several serine/threonine kinases are activated by inflammatory stimuli contributing to IR, including JNK, IKK, and others. Activation of these kinases takes place in situations where inflammatory and metabolic pathways are triggered, which is also seen after Toll-like receptor (TLR) activation, for example. 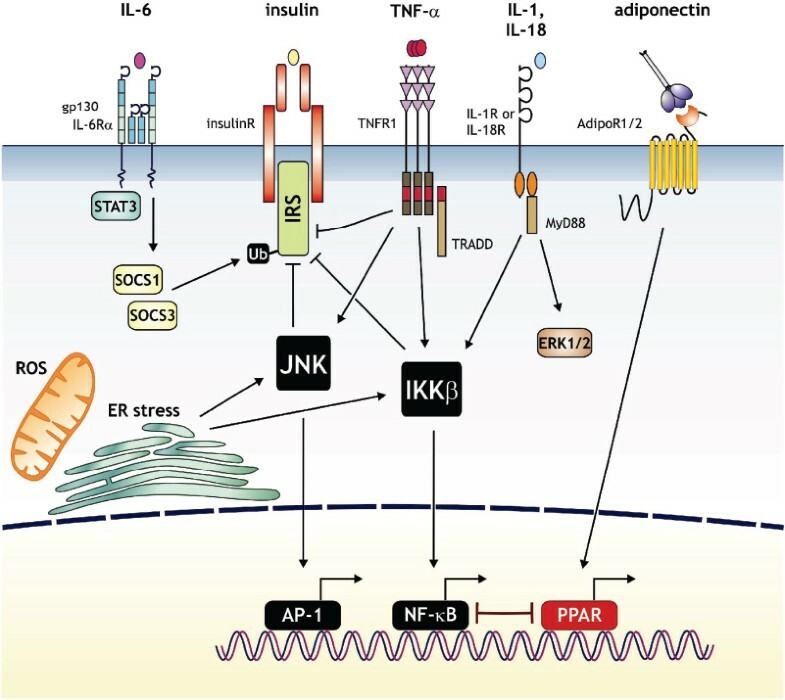 JNK has recently emerged as an important regulator of IR in obesity (79). The JNK group belongs to the group of MAPKs and controls many cellular functions through regulation of activator protein-1 (AP-1), including c-Jun and JunB. In obesity, JNK activity is increased in the liver, muscle, and fat tissues probably owing to the increase of FFA and TNF-α, and loss of JNK1 prevents the development of IR in both genetic and dietary models of obesity. Liver-specific knockdown of JNK1 indeed lowers circulating glucose and insulin levels, proving its role in the development of IR (80). ER stress response. Recent experimental evidence suggests that endoplasmic reticulum (ER) stress is important in the initiation and regulation of inflammation and insulin action as observed in IR (1). Folding, maturation, storage, and transport of most proteins take place in the ER. In case folding is disturbed, an unfolded protein response (UPR) is initiated to restore this organelle, which involves three key molecules: inositol-requiring enzyme-1 (IRE-1), PKR-like endoplasmic-reticulum kinase (PERK), and activating transcription factor 6 (ATF6) (81). Two important pathways in the regulation of IR that have already been discussed, namely NF-κB/IKKβ and JNK-AP-1, are linked to activation of IRE-1 and PERK (82). Indeed and as expected, ER stress is involved in both dietary and genetic models of obesity and regulation of IR (83). ATF6 and X-box binding protein-1 (XBP-1) are critical regulators of ER function and its adaptive responses, as gain- and loss-of-function studies with XPB-1 demonstrated the close interaction with insulin action in vitro and in vivo (83). PPAR-γ. PPARγ is a genetic sensor of fatty acids and a member of the nuclear receptor superfamily of ligand-dependent transcription factors. This transcription factor is required for fat cell development and is the molecular target of TZDs, which exert insulin-sensitizing effects in adipose tissue, skeletal muscle, and liver. TZDs also negatively regulate the stimulus-dependent production of various pro-inflammatory cytokines that promote IR. Within adipocytes, TZDs suppress the synthesis of IL-6, TNF-α, PAI-1, MCP-1, and angiotensinogen. In macrophages, where PPARγ is also expressed, it inhibits TLR- and IFN-γ-mediated inflammatory responses. As macrophages prominently invade adipose tissue in obesity, macrophage-derived PPARγ recently gained considerable interest. Hevener et al. (84) presented evidence that macrophage PPARγ is essential for normal skeletal muscle and liver insulin sensitivity. They found that inactivation of PPARγ in macrophages led to glucose intolerance associated with skeletal and hepatic IR even in lean mice fed a normal diet. IR was even more pronounced when mice lacking macrophage PPARγ were fed a high-fat diet, and these mice were only partially responsive to TZD treatment. This indeed suggests that for a proper TZD response, macrophage PPARγ expression is essential. In obesity, adipose tissue is loaded with macrophages resulting in local inflammation, thereby aggravating IR. Different types of macrophages reside in the adipose tissue (85). Whereas resident macrophages present in adipose tissue of lean mice display the alternatively activated phenotype (M2 or alternatively activated macrophages characterized by activated genes for Ym1, arginase 1, and IL-10) (85), pro-inflammatory classically activated macrophages are recruited to sites of tissue damage in the adipose tissue as in obesity (M1 or classically activated macrophages producing enhanced levels of TNF-α and iNOS). Diet-induced obesity influences the state of adipose tissue macrophages from an M2-polarized state in lean animals that protects adipocytes from inflammation to an M1 pro-inflammatory state leading to IR. This obesity-induced phenotypic switch in adipose tissue macrophage polarization has been recently demonstrated as being orchestrated by PPARγ (86). Using mice with specific macrophage deletion of PPARγ, these researchers demonstrated that PPARγ is required for the maturation of alternatively activated macrophages (M2 macrophages). Because of space limitations, we are unable to provide an extensive overview of an important group of key mediators that also act at the interface of lipid metabolism and inflammatory pathways. These molecules include the LXR family of nuclear hormone receptors (87–91) and the SREBP family of transcription factors (92–95). Acute-phase proteins. C-reactive protein (CRP), the most important human acute-phase protein, correlates with states of IR (96). CRP in most instances is considered as an inflammatory marker related to atherosclerosis and cardiovascular diseases (97,98). Human CRP, however, might also have some anti-inflammatory properties, as it reduces atherosclerosis development in a mouse model with human-like hypercholesterolemia (99). CRP has been demonstrated to upregulate the synthesis of anti-inflammatory cytokines such as IL-1 receptor antagonist (IL-Ra), which could help to explain the above phenomenon (100). Recently it has been suggested that CRP might play a role in leptin resistance by acting as a serum leptin-interacting protein (101). Adipocyte-fatty-acid binding protein (aP2, FABP4). Fatty acid-binding proteins are a family of 14- to 15-kDa proteins that bind with high affinity to the hydrophobic ligands such as saturated and unsaturated long-chain fatty acids and eicosanoids. Adipocyte-fatty-acid binding protein, aP2 (FABP4), is expressed in adipocytes and macrophages, links inflammatory and metabolic processes, and is mainly regulated by PPARγ agonists, insulin, and fatty acids. Deficiency of aP2 protects mice against the development of IR associated with genetic or diet-induced obesity (102). The macrophage is a critical site of FABP action, and total- or macrophage-specific aP2-deficiency leads to a marked protection against early and advanced atherosclerosis in apolipoprotein-deficient mice. Furuhashi et al. (103) have recently demonstrated that an orally active small-molecule inhibitor of aP2 is an effective therapeutic agent against severe atherosclerosis and T2DM in various mouse models. Osteopontin. Osteopontin (OPN) is a secreted matrix glycoprotein and pro-inflammatory cytokine playing an important role in cell-mediated immunity. Its ability to interact with integrin surface molecules through an Arg-Gly-Asp sequence and with the CD44 receptor has established this mediator as an important signaling molecule. Indeed, tissue infiltration of macrophages as observed in obesity is dependent on the expression of OPN, which promotes monocyte chemotaxis and motility. Recently, Nomiyama et al. (104) demonstrated that mice after a high-fat diet exhibited increased circulating OPN levels. Obese mice lacking OPN showed improved insulin sensitivity and decreased macrophage infiltration into adipose tissue. These experiments add OPN to a long list of pro-inflammatory pathways involved in the development of IR. Protein kinase C. Protein kinase C (PKC) is also important in the interactions between inflammatory and metabolic pathways. PKC6-knockout mice are protected from fat-induced IR (105). Three-day high-fat feeding to rats results in hepatic steatosis and hepatic IR, which is associated with activation of PKCe but not other isoforms. Treatment with an antisense oligonucleotide against PKCe protects rats from fat-induced hepatic IR. Furthermore, this treatment reversed impaired insulin signaling, supporting its role in the development of IR and suggesting another potential therapeutic pathway (106). iNOS. Inducible nitric oxide synthase (iNOS) and its deletion is associated with improvement of high-fat diet-induced IR. Recently it has been demonstrated that blockade of iNOS by N(G)-nitro-L-arginine methyl ester (L-NAME) improved high-fat diet-induced obesity and glucose intolerance. These effects were accompanied by a reduction of inflammation in the adipose tissue and improved signaling in skeletal muscle (107). Oxidative stress. One of the final common mediators of IR seems to be oxidative stress due to generation of reactive oxygen species (ROS) and/or decreased antioxidant defenses (108). In both nonalcoholic steatohepatitis and experimental steatohepatitis, hepatic expression of CYP2E1 is increased, leading to oxidative stress. This enhanced expression has been demonstrated to impair insulin signaling (109). Further supporting the importance of ROS in NAFLD, Xu et al. (110) recently demonstrated a key role for the Nrf1 gene in NASH. Mice with liver-specific deletion of Nrf1, a gene mediating activation of oxidative stress response genes, develop all features of nonalcoholic fatty liver disease including steatosis, apoptosis, necrosis, inflammation, fibrosis, and finally liver cancer—highlighting the importance of oxidative stress in this disease. Infliximab has been demonstrated to reverse steatosis and to improve insulin signaling in a rat model of high-fat diet-induced IR, suggesting that neutralization of this key cytokine improved not only liver inflammation/steatosis/ fibrosis but also insulin signaling (111). Importantly, so far studies using neutralizing anti-TNF antibodies in humans have not shown improved insulin sensitivity (112,113). Single doses of TNF-α antagonists failed to improve IR in diabetic or obese subjects (112,114). Subsequent placebo-controlled studies conducted over a treatment period of 4 weeks provided no improvements in insulin sensitivity in obese, diabetic subjects (115) or in obese, insulin-resistant subjects without diabetes (113). Lo et al. (116) recently demonstrated in a study in metabolic syndrome that etanercept therapy increased total adiponectin concentration, but concentrations of the high-molecular-weight form—which is thought to mediate insulin sensitivity— were unchanged. Another recently published study investigated the effect of adalimumab on IR in rheumatoid arthritis patients. These patients with active disease showed marked IR that was not influenced by anti-TNF therapy despite a reduction in systemic inflammation (IL-6, CRP serum levels) during the treatment (117). Thus, at the moment TNFα blockade appears to have no efficacy on IR in humans. ER stress is, as mentioned, a key link between obesity, IR, and T2D (1). Pharmaceutical chaperones such as 4-phenyl butyric acid (PBA) or endogenous bile acids and derivates such as ursodeoxycholic acid (UDCA) (including its taurine-conjugated derivates [TUDCA]) are able to modulate ER function and its folding capacity. Indeed, Ozcan et al. (118) have recently demonstrated that treatment of obese and diabetic mice improved hyperglycemia, insulin sensitivity, and fatty liver disease. Interestingly, insulin activity was increased in all target organs such as liver, muscle, and adipose tissues. It has to be mentioned that concentrations used—for example, for UDCA—were approximately ten times higher (118) than those achieved in humans and treatment of patients with nonalcoholic steatohepatitis with UDCA so far has not been successful (119). The glucose-lowering effects of salicylates were identified more than 130 years ago by William Ebstein (76). Whereas these effects might be mainly attributed to its effect on NF-κB inhibition (74), recent studies have also demonstrated that that high-dose aspirin (up to 7 g/day) improves glucose tolerance and triglyceride levels (120). These positive effects of high-dose aspirin on IR are, however, limited by its toxicity profile, especially in the gastrointestinal tract. Nonacetylated salicylates with fewer side effects such as salsalate also inhibit NF-κB through direct inhibition of IKKβ (75). These compounds do not prolong bleeding time, and trials investigating the effects of this drug on inflammation and IR have been initiated in patients with T2D. As inflammation is considered crucial in the pathogenesis of IR, several other drugs commonly used in this patient population are studied in this direction. Randomized clinical trials with statins have demonstrated reductions in CRP and cytokine levels, although statins are not able to improve IR or glycemia (121,122). The PPARγ ligands pioglitazone or rosiglitazone are used to improve insulin sensitivity in patients with T2D. As macrophages are of key importance in the pathogenesis of IR, targeting PPARγ in these cells might represent one major mechanism of these powerful drugs. Recently some caution on this drug class has been raised, as meta-analyses demonstrated an increased rate of cardiovascular events in certain patient groups (123,124). IL-1Ra is markedly upregulated in the serum of obese patients, is correlated with BMI and IR, and is overexpressed in the white adipose tissue of obese humans (125). Treatment of T2D patients with recombinant human IL-1Ra improves glycemic control, clearly highlighting the role of inflammation in T2D and IR (126). This is the first and important evidence that an anti-inflammatory strategy might indeed improve glycemic control and IR. It became evident in the last year in many in vitro and animal studies that various pro-inflammatory cytokines, adipocytokines, and transcription factors are critically involved in the pathogenesis of IR. This intriguing concept is also supported by many clinical observations in patients with T2D and NAFLD, where IR is correlated with a state of low-grade chronic inflammation. Based on these findings, scientists have started to examine whether anti-inflammatory strategies in humans are able to revert IR, and thereby are demonstrating that indeed inflammation significantly drives the development of IR. These studies, however, are still in their infancy, and currently we have only limited data in hand showing that anti-inflammatory strategies may improve IR. This work was supported by the Christian Doppler Society and a grant from the Austrian Science Foundation (P17447).